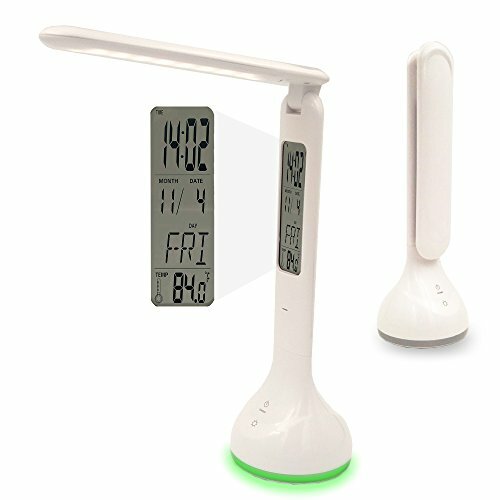 ZHOPPY LED Desk Lamp with Calendar, Thermometer and Clock is a simple but modern design LED desk lamp. It helps protect your vision with 250LM light source. Foldable light arm offers you flexibility to adjusting light source to best fit angle. 18 pcs of LED beads provide you natural and non-flickering light source. It can help to protect your vision by reducing eye fatigue. It also save your electricity bill. LED lamp just consumes 1/8 electric of traditional lighting. Foldable light arm design allows you to adjust the light source best fit your need. The 3.5inch diameter lamp base just occupy very little space on your desk. The LED Desk Lamp has 2 touch sensor switches. The top switch offers 3-level dimmable control. The base color changing LED can be turned on / off with bottom touch switch. Built-in 1200mAh battery not only makes it portable, but also a good emergency light which can offer you up to 4 hours light source. The simple but elegant design makes itself a good decoration for your desk and bedside. The color changing base LED is definitely a great addition. Dimensions: 3.4in. x 3.4in. x 10.5in. LED Desk Lamp: 18 pcs of LED beads provide you natural and non-flickering light source. It can help to protect your vision by reducing eye fatigue. It also save your electricity bill. LED lamp just consumes 1/8 electric of traditional lighting. Foldable and Space Saving: Foldable light arm design allows you to adjust the light source best fit your need. The 3.5inch diameter lamp base just occupy very little space on your desk. Touch Sensor Switches: The LED Desk Lamp has 2 touch sensor switches. The top switch offers 3-level dimmable control. The base color changing LED can be turned on / off with bottom touch switch. Portable Emergency Lighting: Built-in 1200mAh battery not only makes it portable, but also a good emergency light which can offer you up to 4 hours light source. Modern Design: The simple but elegant design makes itself a good decoration for your desk and bedside. The color changing base LED is definitely a great addition. If you have any questions about this product by ZHOPPY, contact us by completing and submitting the form below. If you are looking for a specif part number, please include it with your message.